What is the Architecture Repository application? 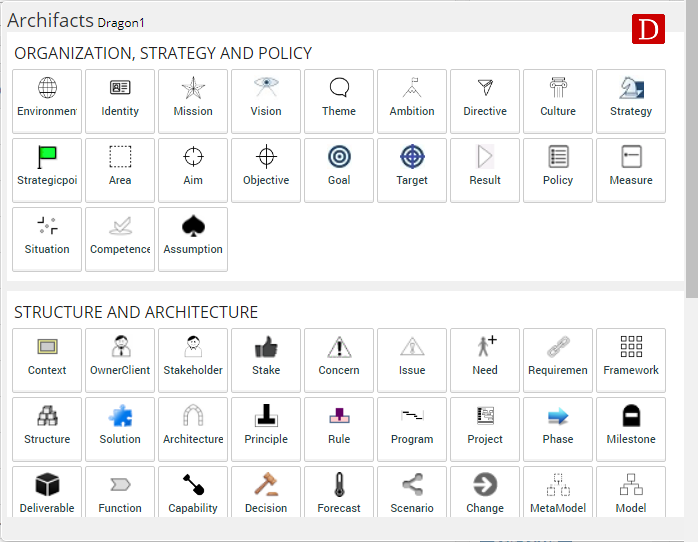 The Architecture Repository is the Dragon1 Application which you can use for documenting all of your enterprise architecture data. 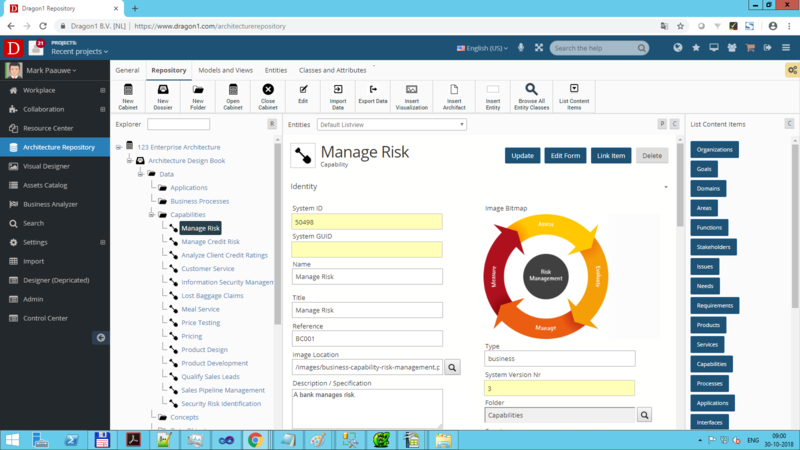 It is perfect storage and management of data and all elements of the enterprise. This is your architecture CMDB tool. 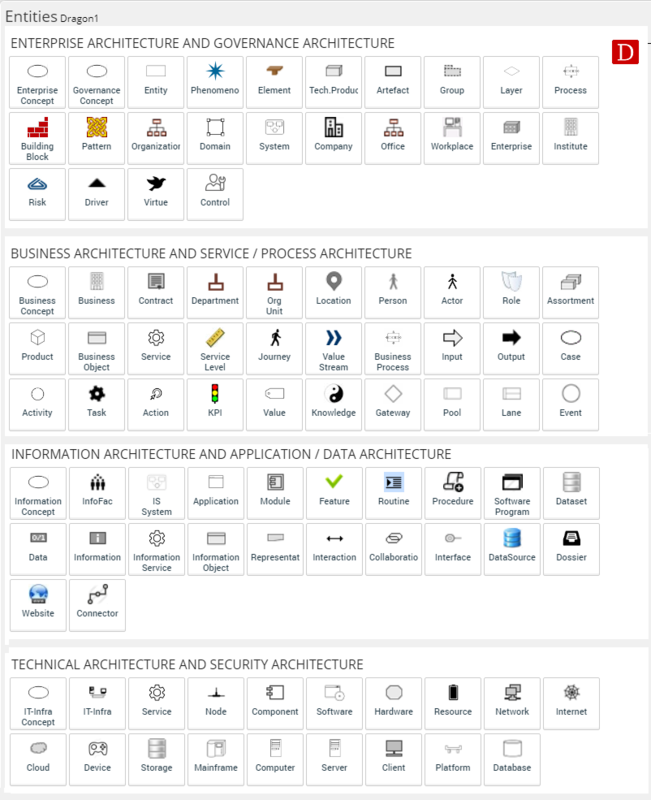 With the architecture repository, you can build a single source of truth for all your data. This increases productivity because people can find the right version of data they are looking for much more quickly. 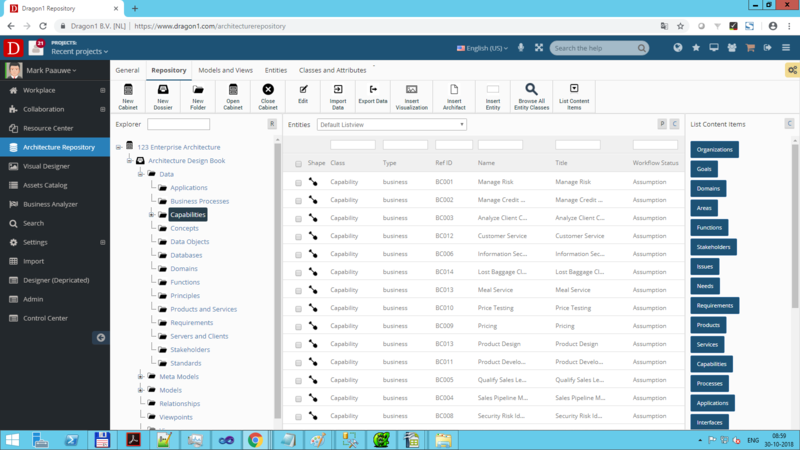 You can enter entity data and combine them into lists, called catalogs, and next manage and moderate these catalogs. Above you see a list of business capabilities that can be turned into a catalog and then reused over and over again in models, views and visualizations. The architecture repository application supports you in entering rich data. Not only the name, descr, type and title of a data item can be entered. You can define as much attributes you like. You can even define new entity classes and entity types. 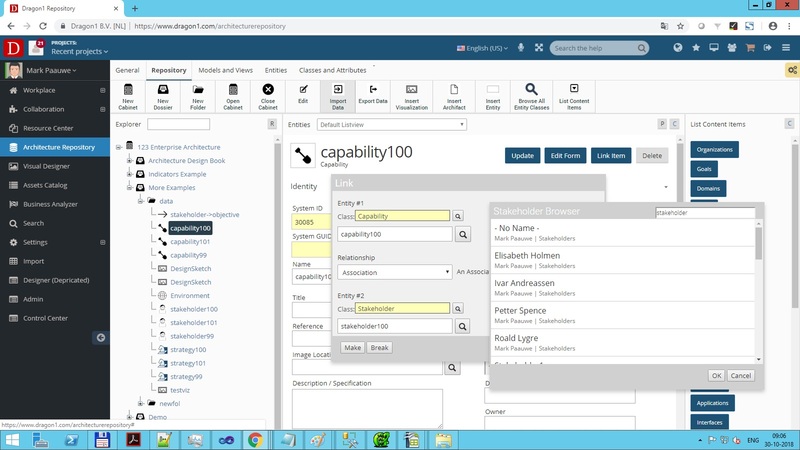 Above you see a business capability selected. You can add any number of attributes with datatypes and value ranges. To increase your productivity even more Dragon1 provides you with a very flexible import and export functionality. Any .dragon1 file, .d1 file, .doc file, .ppt file, .vsd file, .xls file, .txt file, .csv file, xml file or common open format file can be imported (intelligently). Screenshot of Architecture Repository showing the quikckand easy Import Dialog for CSV files. The Architecture Repository provides you with a free and flexible logical structure you can store your data items in. There are three structure elements: Cabinets, Dossiers and Folders. A cabinet is the highest structure element. A cabinet contains one or more dossiers. A dossier contains one or more folders. 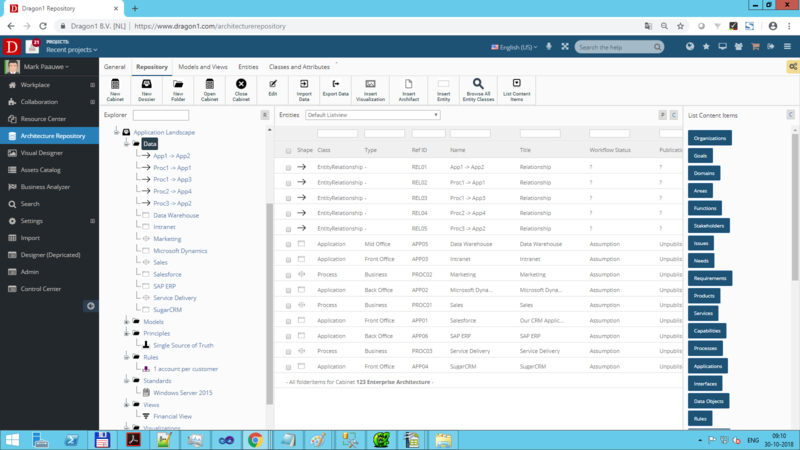 You can create as many cabinets, dossiers and folders you like in one account. And you can store as much data items in a folder you like. Dragon1 has 400+ entity classes build in you can enter data for right away. Here is a list of the entity classes you can enter data for. The most important entity classes with regards to enterprise architecture you can store data items for are: architecture, structure, enterprise, business, capability, function, process, product, service, application, need, requirement, stakeholder, owner/client, concept, element, component, object, building block, principle, pattern, view, viewpoint, rule and design. And many, many more. This wide range of predefined entity classes make sure you can work with any framework, method, approach, language or standard on Dragon1. Below you can see the common shapes or symbols for entityclasses we have (from the Dragon1 EAML). The architecture repository also supports working only with the ArchiMare, BPMN or UML shapes. All the data that is entered by users on Dragon1 is stored in databases in our secure data center. Every account on Dragon1 has its own database instance. Data of accounts are mixed but stored separately. This is called multitenant databases. On Dragon1 every user login is connected to an account and an account can have many user logins. This means you as an individual or as a team can work together on one repository and share data. The access to data is controlled by the creator of a cabinet, dossier, folder or data-item. And the admin login of the account controls who has privileges for a set of actions. The architecture repository enables you to create relationships between data items. And by doing this you create models. The architecture repository enables you to create metamodels, users models and instance modes. For example, a metamodel could exist of entity classes like 'process' and 'application' and a rule that every process must be supported by at least one application. A user model could exist of entity types like 'sales process' and 'procurement process' and a 'CRM application' that supports both processes. You can choose whether or not this user model has to be compliant to the metamodel. An instance model could exist out of the instance of the processes and applications. Maybe the organization has five locations where the sales process is executed and maybe there are 10 installations of the CRM system. 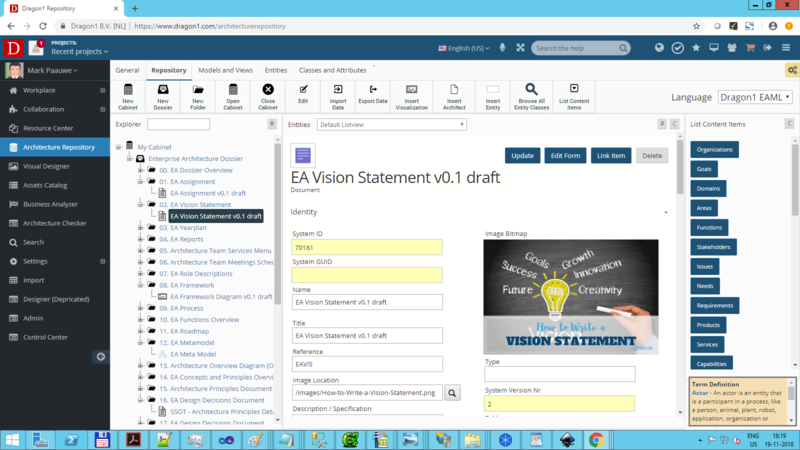 Dragon1 provides you with a EA Dossier Standard. 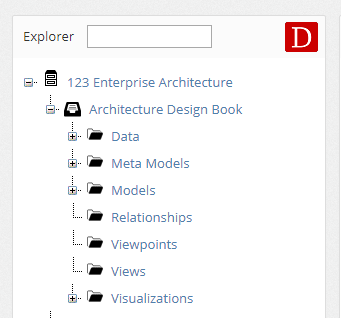 By default the Architecture Repository opens with 'My Cabinet' containing all the folder and empty files that are part of the EA Dossier standard. This saves you a lot of time and resources and prevents reinventing the wheel. Of course you can rename the cabinet, dossier, and edit and delete and create folders and files. Below is an overview of basic features of the Architecture Repository per edition. Interested to use the Architecture Repository?